Growth must be the number one priority for Ireland. The importance of the growth agenda was brought home to me by the recent OECD report on Ireland. 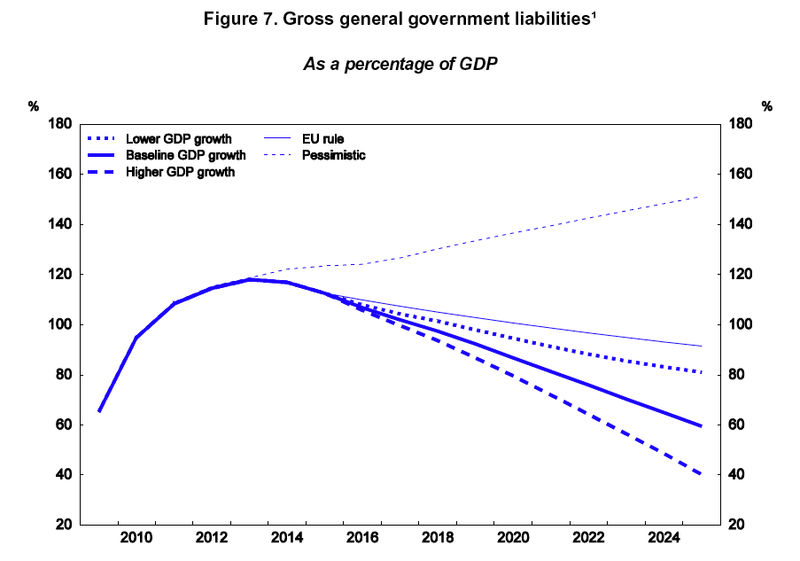 The chart from the report shows the trajectory of Ireland's gross government liabilities as a percentage of GDP given different growth scenarios to 2025. The impact of even modest differences in projected nominal GDP growth (plus or minus 0.8% per year in the higher/lower scenarios) is huge. The central or baseline scenario assumes 4.8% nominal annual growth, or real growth of 2.8% when inflation is stripped out. Put simply, the combination of China’s export-driven growth and the desire to build up FX reserves to prevent a repeat of the 1998 currency crises generated a glut of savings which was invested in western bonds, causing a fall in their yields. In principle, this drop in interest rates might have triggered a boom in real capital spending. But it didn’t, perhaps because the "great stagnation" meant there was a dearth of investment opportunities. Instead, lower rates unleashed a bubble in house prices, the bursting of which brought down banks. Nevertheless, the growth agenda needs to be pursued vigorously. And not just in Ireland. Now the world has 7 billion mouths to feed, getting on a path to sustainable growth is more vital than ever. Whilst there have been many suggestions for how best to kick start growth (for example ICTU's recent call for a €6 billion investment programme over the next 3 years), most ignore the biggest long term issue affecting growth: demography. Finally, the global retreat from marriage is also likely to depress and distort economic growth. Evidence drawn from Europe and North America indicates that children who are raised in an intact, married home are more likely to excel in school and be active in the labor force as young adults, compared to children raised in nonintact homes. Married adult males also work harder than their unmarried counterparts and enjoy an income premium over single men of between 10 and 24 percent, in countries ranging from Germany to Israel to Mexico to the United States. These findings suggest that market economies in the Americas and Europe—from Canada to Chile, from Spain to Sweden—that are now experiencing a retreat from marriage will also reap a new crop of problems as fewer children have the opportunity to acquire the human and social capital they need to thrive in the global economy and as fewer men have the motivation that marriage brings to fully engage the world of work. Reversing the retreat from marriage might not seem like an obvious solution to the growth problem we are facing (to economists anyway), but feeding 7 billion men, women and children - and the next billion that will be born in the decades ahead - will take all the economic, social and technological skills we can muster. It will also hold out the prospect of a better future than merely one in which we dutifully pay off our debts - and the debts of others foisted upon us.